In Today's Post, I am going to show you Quick Example codes that how you can use python textwrap module? Before our Practical Illustration let's Understand Some Basic Queries. Q 1. What is textwrap? Ans. Textwrap is a Standard Python Module That Provides Us Special Facilities For Text Wrapping And Filling. In Simple Words, This Module Help Us To Manage Every Line Of Text String In Special Format with the use of tabs, spaces for adjusting the width of lines in specific numbers of characters long. Q 2. Where it can be useful? Ans. It can be used Anywhere In any python project to print and formatting text strings quickly. Q 3. Need to Install it? Ans. No, Because of Its Comes With Python Pre-Installed. # Here, I am Going To Demonstrate textwrap.fill() function. # manage all text in a Specific Character Width. --obvious way to do it. let's do more of those! unless you're Dutch. Now is better than never. honking great idea -- let's do more of those! than complicated. Flat is better than nested. Sparse is better than dense. Readability counts. Special cases aren't special enough to break the rules. Although practicality beats purity. Errors should never pass silently. one honking great idea -- let's do more of those! 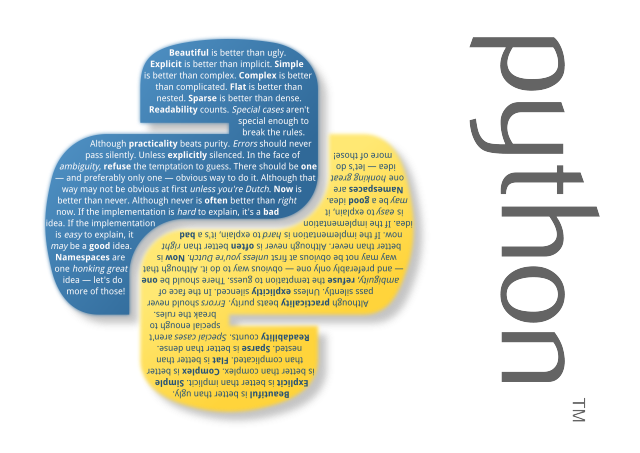 The Zen of Python, by Tim Peters  Beautiful is better than ugly. Explicit is better than implicit. Simple is better than complex. Complex is better than complicated. Flat is better than nested. be a good idea. Namespaces are one honking great idea -- let's do more of those! # remove extra space characters from string.